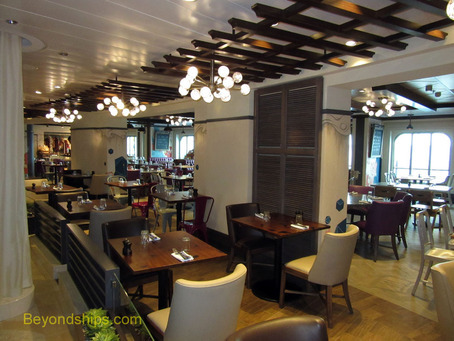 Jamie's Italian has emerged as the most popular of the specialty restaurants on Quantum of the Seas. Everyone that goes there seems to love it and word quickly gets around the ship As a result, it becomes increasingly difficult to get a dinner reservation and for lunch, which is done on a first come, first served basis, guests line up before the restaurant has opened to ensure that they will get a table. The popularity of Jamie's Italian is not surprising. Most people like Italian food this is popular celebrity chef Jamie Oliver's take on Italian food. It may not be authentic Italian cuisine but it is done in a way that people in Britain and America will like. Jamie's is located on the port side of Deck 5 on the Via promenade. In fact, it is essentially open to the Via on one side and like a sidewalk cafe, guests can watch people passing by. Inside the restaurant, the décor eludes to a rural Italian market with rough wood touches and a display with garlic and other vegetables hanging at one end. This is not a specialty restaurant where you have to dress up. The atmosphere is casual. 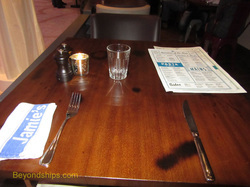 Indeed, the tables are bare and the napkins are more like hand towels than linen. The dinner experience began with the server giving a little background about the restaurant. She then gave a series of recommendations. Throughout the service was friendly and attentive. Following one of the server's recommendations, we began with the baked chestnut mushrooms. The mushrooms were cooked with mozzarella and lain on a bed of crispy thin bread. It had a nice smokey flavor. The menu points out that “our pasta is made fresh here every day with the beast flour and free-range eggs.” You can have the pasta dishes, with the exception of the lasagne, either in a small starter portion or as a main course. While the lasagne has beef and pork in it, it is not like most meat lasagnes that you find in Italian restaurants. The meats have been blended into a ragu and thus there are no solid pieces of meat. In addition, the lasagne has pumpkin in it. Nonetheless, it is quite tasty. It arrives hot from the oven in its own pan. Be sure to let it cool so that the temperature does not mask the subtle flavors. Aubergine is what Americans call eggplant. Thus, Jamie's Aubergine Parmigiana translates into eggplant parmigiana. As such, this is another classic comfort food, which comes with fresh-baked garlic bread. 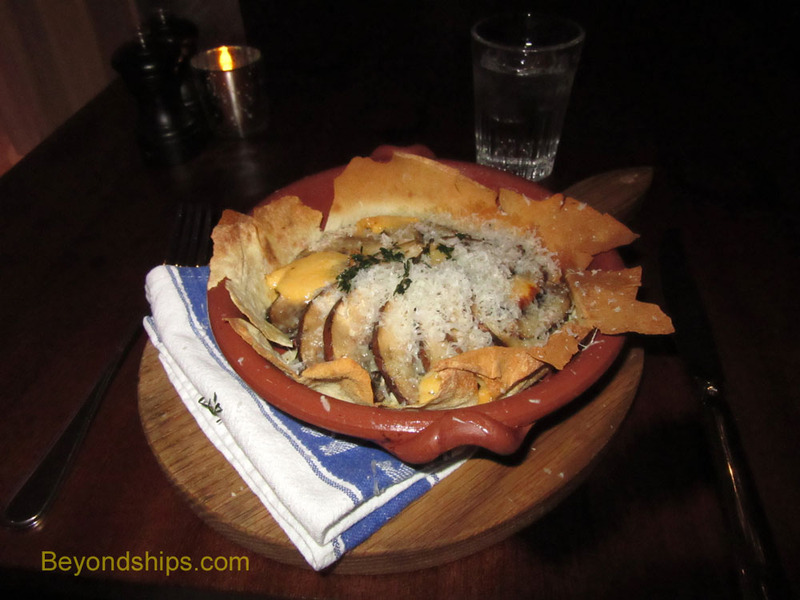 The eggplant was moist and combined harmoniously with the tomato sauce and cheese..
Our server recommended the Amalfi Lemon Meringue Cheesecake for dessert. But after having cheese in the ample portions of the previous courses, we opted instead for ice cream. According to the menu, the ice cream could be combined with seasonal fruits. However, inasmuch as this was the end of the cruise, all that the server could offer in the way of fresh fruit were orange slices. This turned out to be a surprisingly good combination as the acidity of the orange contrasted with the creaminess of the ice cream. There is an additional charge for this restaurant. Below: Aubergine Parmigiana with garlic bread. Below: Ice cream with orange slices.